I entered my Sunflower Stars quilt in the Effingham Crossroads Quilt Show a week ago and I brought home a 1st place ribbon and a Best of Show ribbon! OMG! It was so cool to get those ribbons! I loved this quilt show. I met a gal there that I had found online at mqresource.com – Elizabeth Karnes. What a VERY nice lady, as well as a wonderful quilter. Her quilt got a 2nd place ribbon in the sme category. While I was there, I got an appraisal done on my quilt by AQS certified appraiser Hallye Bone. It appraised at just under $5000. OMG! Crazy! She said she thought I should enter it in Paducah and also thought I should look into getting a pattern published. I’m actually thinking of doing a “book” instead. I have 3 original designs – 2 finished and 1 I’m working on. The 1st quilt (Pretty in Purple) did not have any trapunto. I would like to quilt another one just like the first one (same fabrics, etc.) but using wool batting and trapunto. Then I could show the same quilt with trapunto and without trapunto. In addition, there would be the Sunflower Stars quilt along with my new one I’m working on now (tentatively named Springtime Shadows). Might make a neat concept for a book – how to turn a good quilt into a showstopping quilt with trapunto. Or something like that. 🙂 What do you think? Would you buy a book like that? Elizabeth Karnes and her quilt at the show. First, congrats on your win(s) with your gorgeous quilt that is just awesome. If you’re going to do a book, I think having the second quilt with trapunto would be a great addition. I’d buy the book, most definitely! I would buy your book and of course I would except to have it autographed. Congratulations on your recent Best of Show at Effingham!! 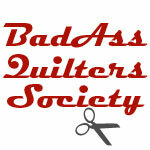 I hope you do enter the quilt in the Paducah quilt show, it would be so awesome to see your beautiful quilt there. Your work is just fabulous, what a talent!! I can’t wait to see your next creation! A star is born!